Tuesday, December 5, 2017 ~ 10:30 a.m. Prayer Service ~ 7:00 p.m.
Memorials to the family & donations will be made to the Gretna Public Schools Special Education Program & to Trinity Lutheran Church in Murdock, NE. Kimberly Ann Jones, 43, of Omaha, NE, died Friday, December 1, 2017 surrounded by her family in rural Ashland, NE. She was born November 19, 1974 in Lincoln, NE to Thomas and JaNelle (Horn) Jones. Kimberly graduated from Elmwood-Murdock High School in 1993 and from Midland Lutheran College in 1997. She continued her education at Wilmington College in Delaware where she graduated with a Master of Education in 2005. Kimberly received a Master of Education and Educational Leadership degree in 2012 from Doane College. 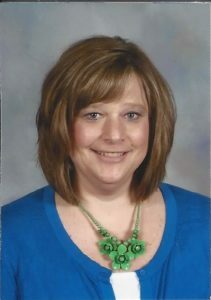 Kimberly was a teacher for Gretna Public Schools at Whitetail and Aspen Creek in the special education department. Grace is the word that defines Kim as she dedicated her life to making an impact on children. As a teacher of 15+ yrs. and an aunt to five nieces and one nephew she made every opportunity a learning experience through crafts and games. Kim cherished every ounce of her vast family and a leader of family traditions. Miss Jones, Aunt Kimmy, Sis and a dedicated daughter will be greatly missed! She is survived by parents, Thomas and JaNelle Jones of Ashland; siblings, Doug (Lori) Jones, Kristi Woodshank and Brad (Stacey) Jones; nieces and nephews, Jace, Stella, Anna, Ellie, Samantha and Maddysen. She was preceded in death by grandparents, Vernon and Donna Horn, John and Mary Jones; uncle, Doran Horn; aunt, Colleen Jones. My very sincere sympathy to all of your family. Kim was one of the most passionate and dedicated Special Education teachers I have ever worked with. She never gave up on students, no matter what their challenges were. She cared and advocated for her students as if they were her own children. I will miss Kim as a colleague and as a friend. Keeping all of you in our thought’s and prayers. I am grateful for the time to have worked with Kim! I have worked with Kim at Aspen Creek since August, but her impact on me, as an educator, is great. Her positive attitude and compassion were evident in all of the students she worked with. I will truly miss working with her. May your memories of Kim give you moments of peace. You are in our thought and prayers at Palisades Elementary. When the decision was made for Kim to be part of the staff at Aspen Creek Elementary I couldn’t have been happier. Her dedication to her students was evident in all she did. She is going to be deeply missed by all. My thoughts and prayers go out to her family. Kim’s smile always brightened my day, my condolences to your family. Please accept my sincere condolences to the family. I am so sorry to hear of the passing of Kimberly. The Bible assures us at Psalms 34:18 that God is near to those broken in heart. My thoughts and prayers are with you all. May your many memories help you find peace and comfort as you go through the coming days.